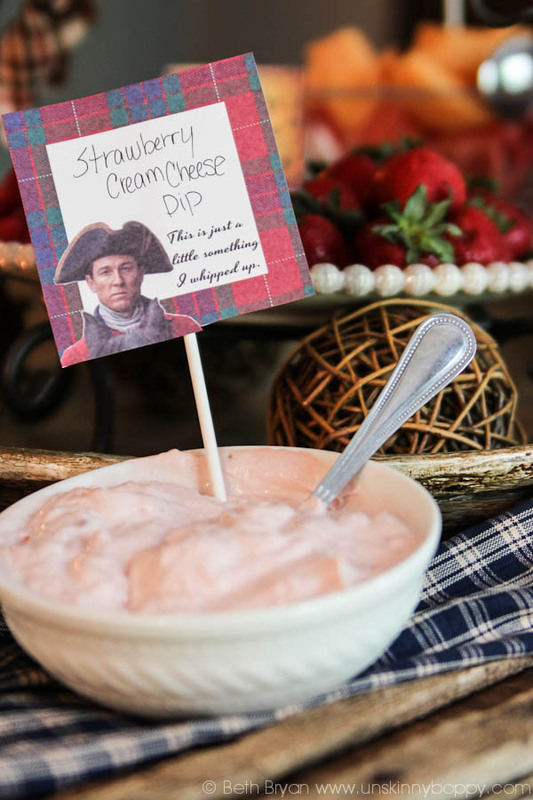 Epic Outlander Premier Party Ideas, Decorations & free Printable Invites! 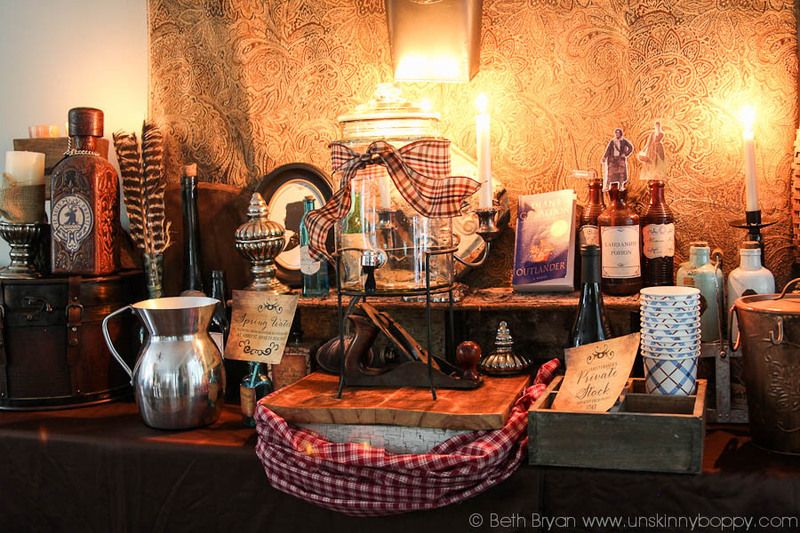 My Outlander Premier party was a raving success last weekend. 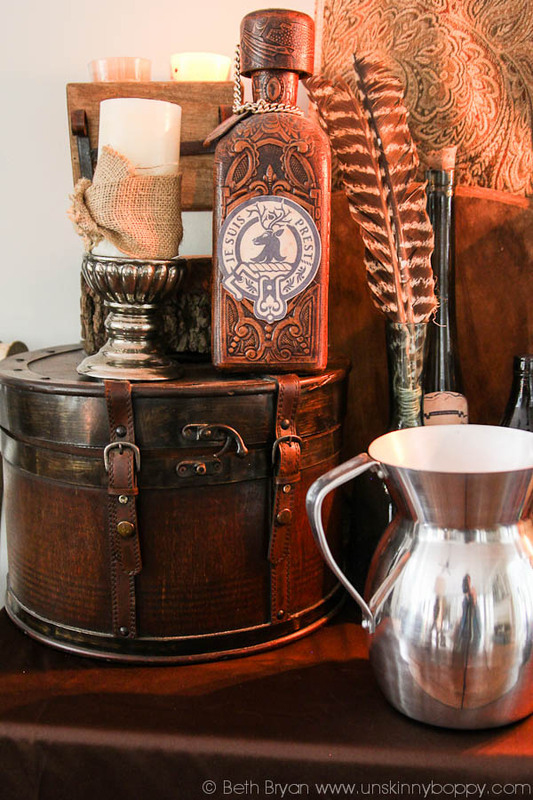 Since this is going to be a very picture-heavy post chock full of all the Outlander theme ideas I created based on the amazing book series by Diana Gabaldon, I’m going to let the photos do most of the talking for me! But be warned- you might not be able to put these books down and they are MASSIVE. Be prepared to lose hours of sleep. 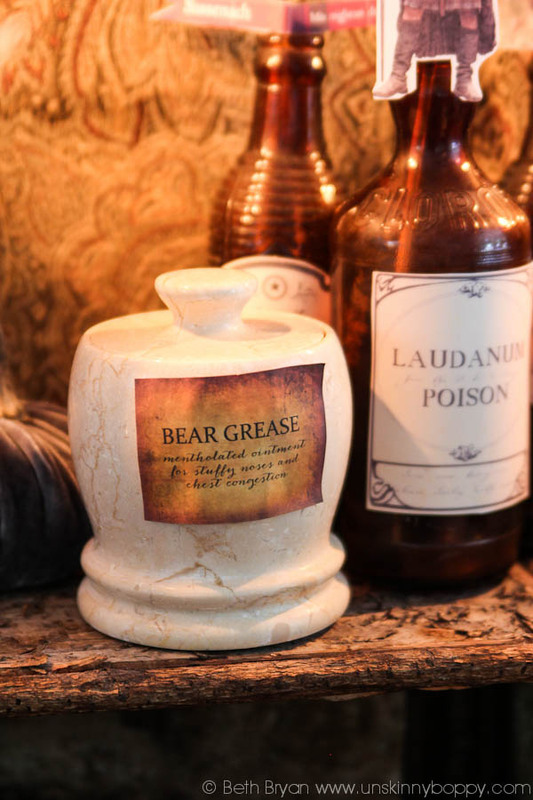 If you have never read or heard of Outlander, then these decorations probably won’t make a lick of sense to you. I’ll try my best to sum it up for you. Claire Randall is on her 2nd honeymoon in Scotland after WWII when she gets transported back in time through a circle of standing stones. She finds herself in the middle of a battle between the British and the Scottish Highlanders, who rescue her from a terrible British officer named Black Jack Randall. The Scots take her back to their castle, where she tries to fit into everyday life while she figures out how to get back through the stones and home again. 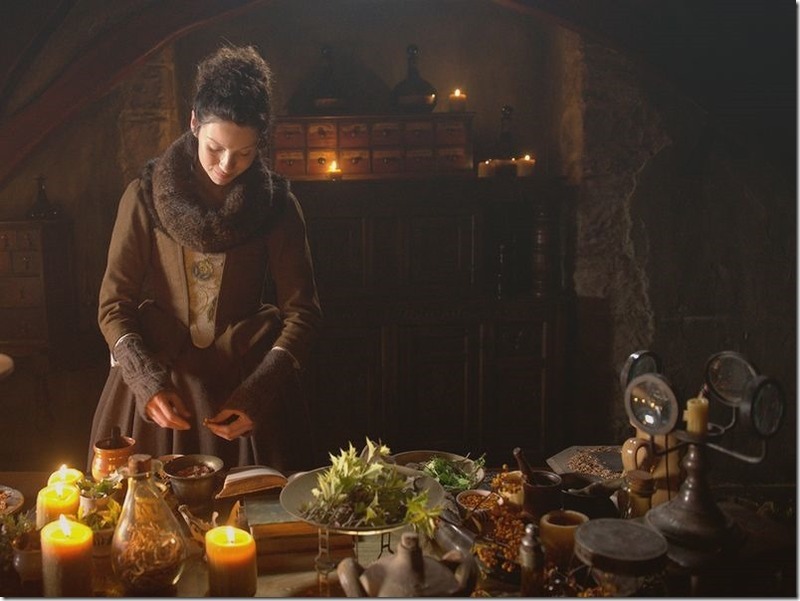 In the meantime, she becomes a “healer” who works with herbal remedies in the basement of Castle Leoch. 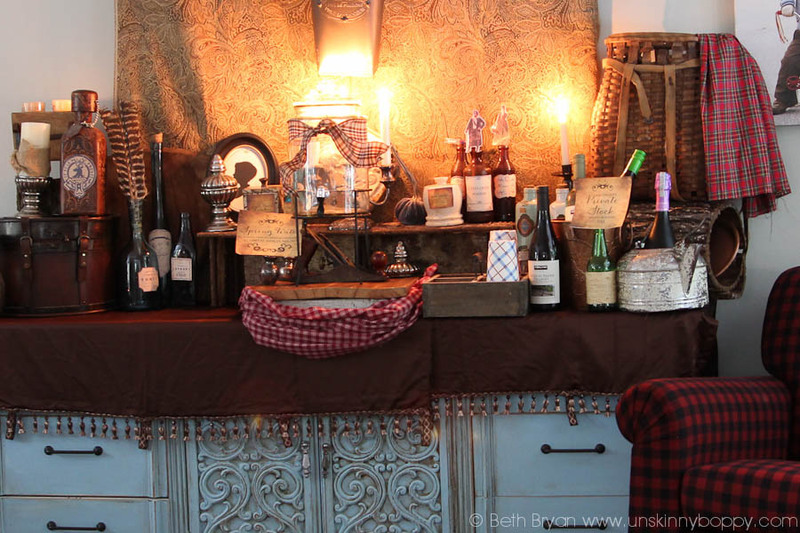 This is the scene I wanted to try to emulate in my drink table. I love all the earthy browns, greens and candle glow of this scene. 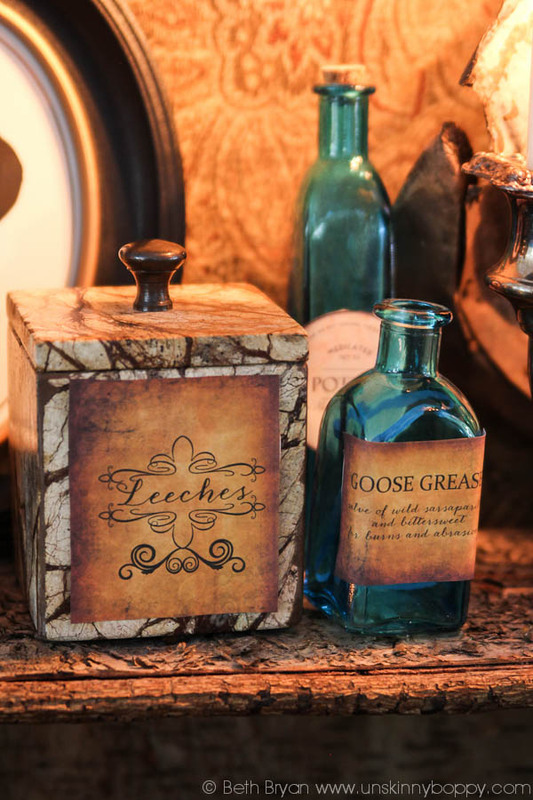 I made these labels using direct quotes from the books. 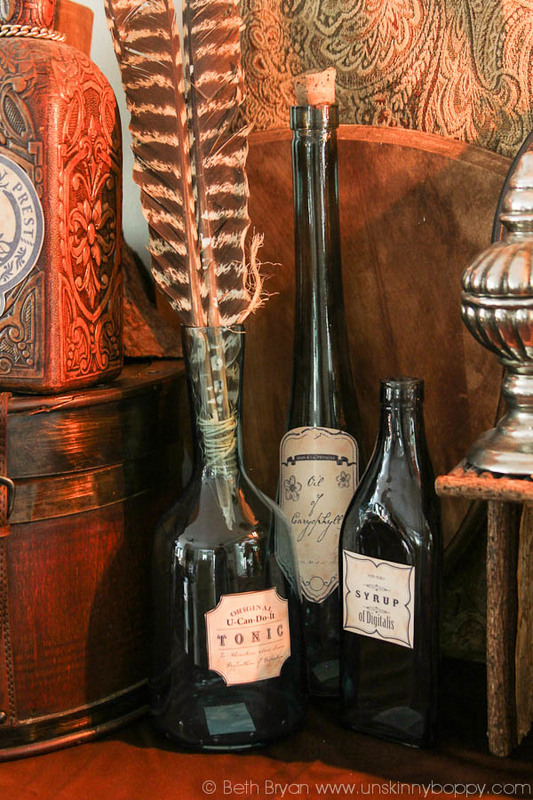 I have read the entire book series, so there are a lot of nods to future characters in the books throughout my decorating. I don’t think I’ve given anything away with these lables, but I won’t go into too much detail on some of them so that I don’t spoil any surprises if you are brand new to the books. And some are just for fun. It was so much fun assembling all of this for the party! I think I should have been a set designer. I downloaded some of the labels from Professional Fangirl’s Free Outlander Printables. 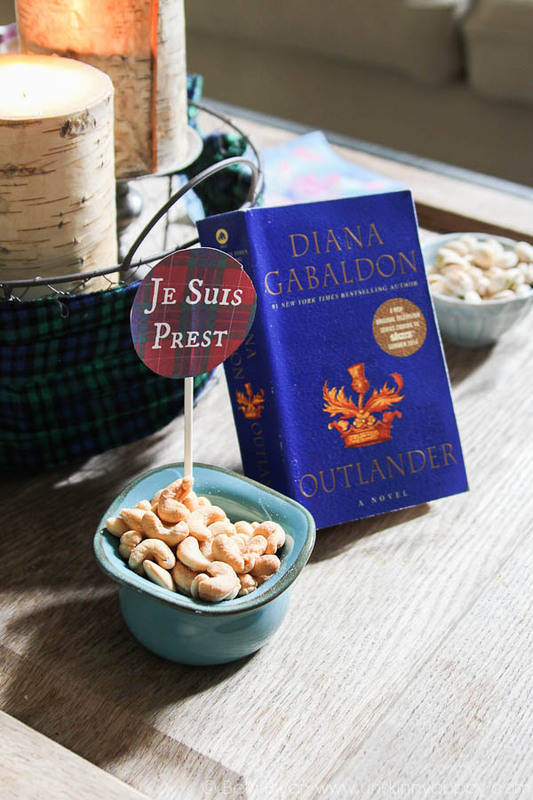 They have a really great selection of free printables for Outlander fans. Any of the red plaid labels that you see came from them. 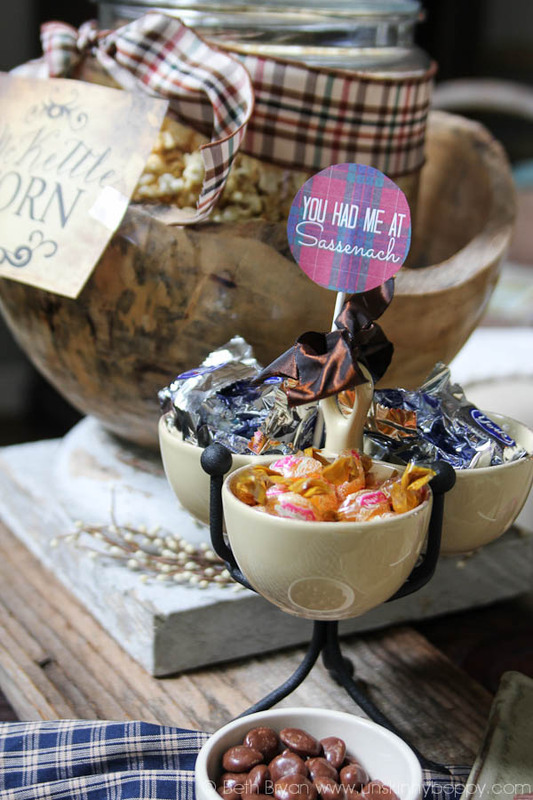 What TV Premier Party would be complete without popcorn and candy? 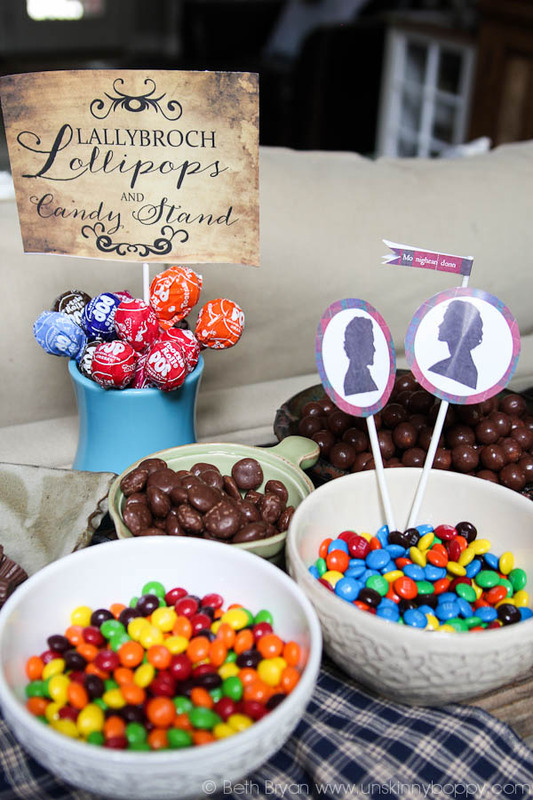 I set up Lallybroch’s Lollipops and Candy Stand on my sofa table. 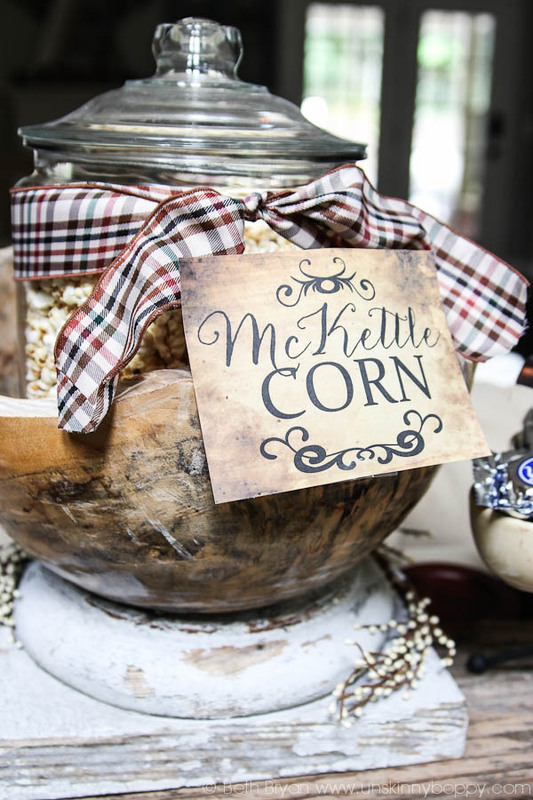 …complete with a big jar of McKettle corn for my guests to munch while watching the show. The circle of standing scones were a huge hit. 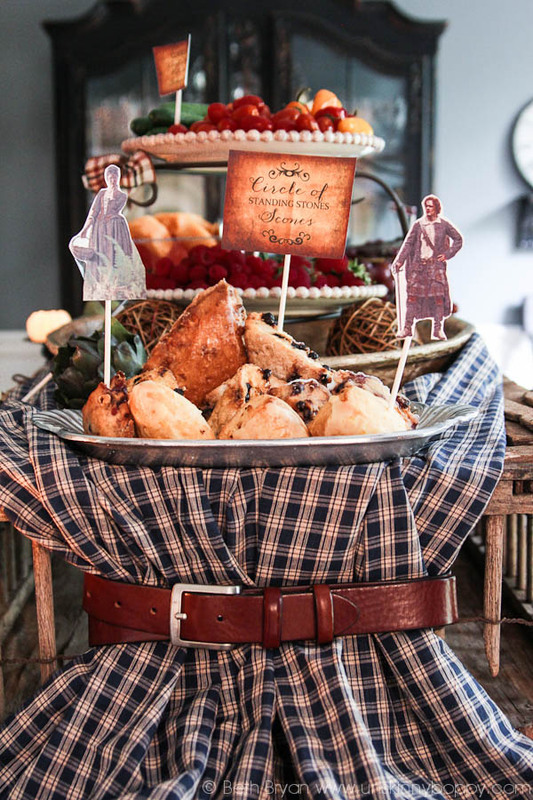 Want to throw an Epic Outlander Premiere Party like this? 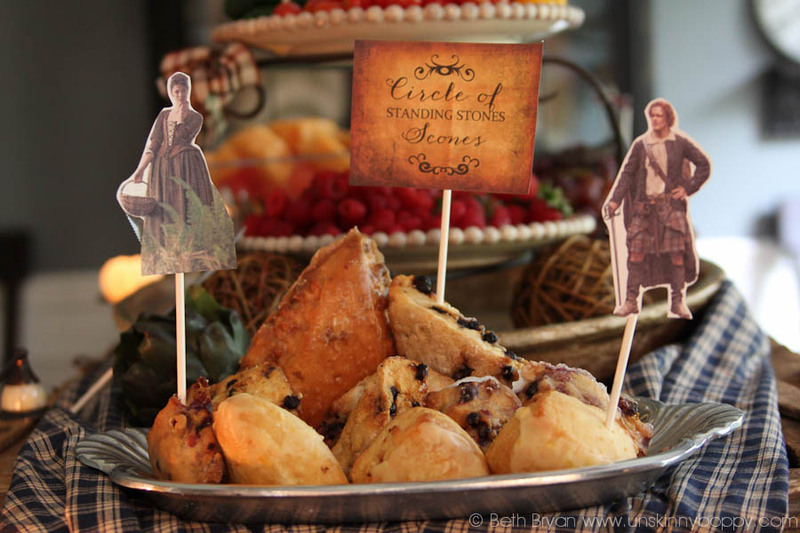 Nothing better than a Saturday night filled with Jamie Fraser and scones. 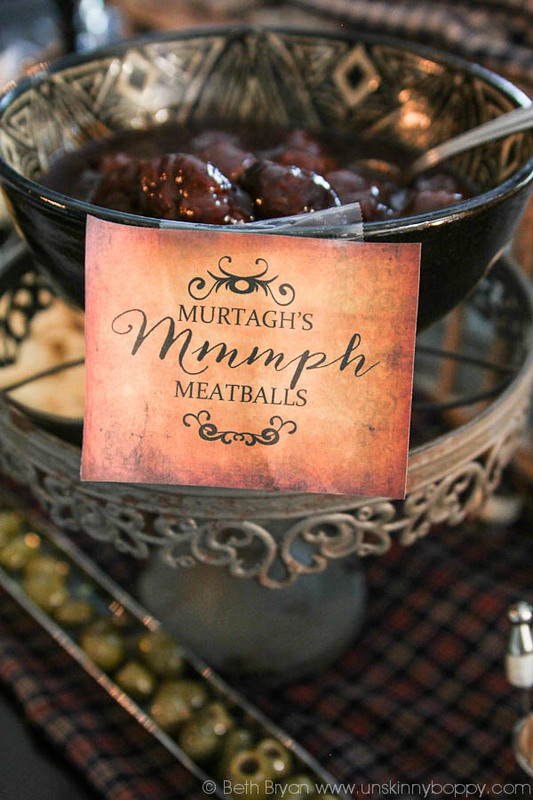 Murtagh’s Mmmmmph Meatballs were also devoured. This was one of the fangirl’s free printables, but it cracked me up. Gotta love a good BJR joke. Most of you will not understand this next label, so let me explain. Sassenach means “English person” which is what Jamie calls Claire throughout the books. “Tulach Ard!” is a battle cry that Jamie says during the first episode when he raises his sword and charges after some redcoats during the cockmagon rock scene. 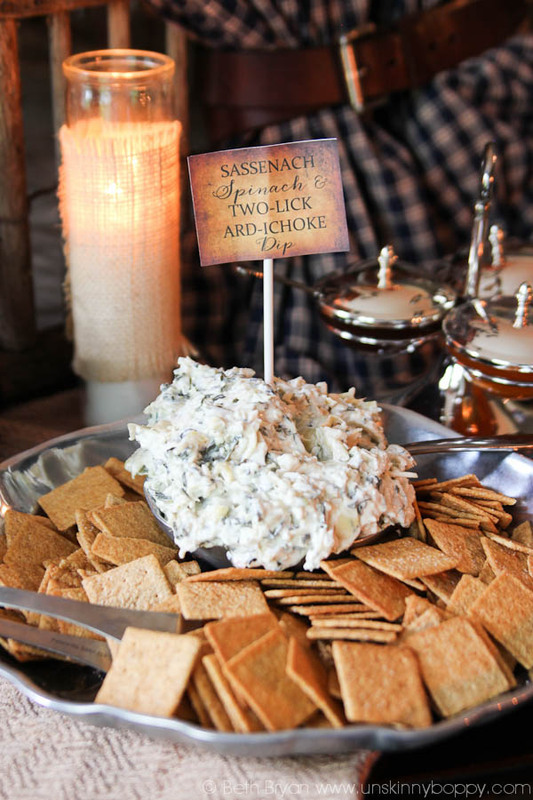 So, let me present to you Sassenach Spinach and Two-lick Ard-ichoke dip. In some of the later books, there is a mean old pig named the White Sow that lives under their house. Here is my ode to her. 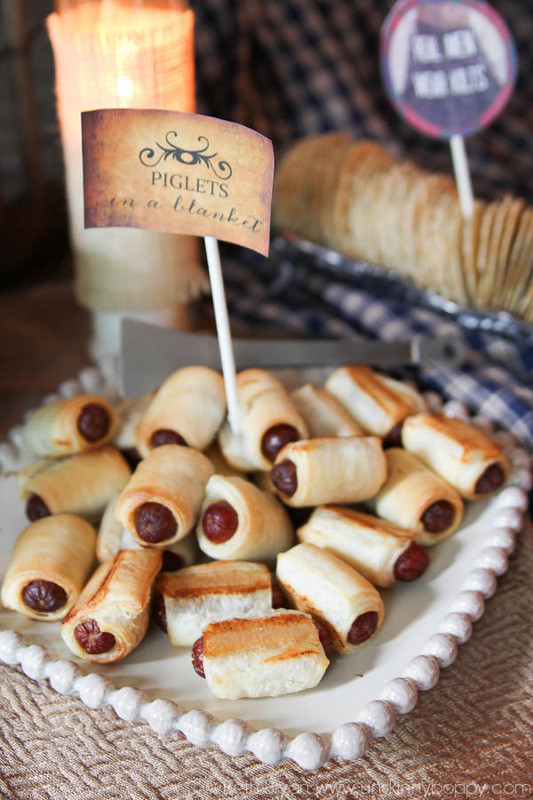 And all her piglets… bless their hearts. I could write a novel on how much I love the Outlander books and why you should watch the new show on Starz but for the sake of brevity, you’ll just have to take my word for it. These ladies all loved it! It was SO fun meeting a bunch of the local ladies from the Alabama Sassenach’s group on Facebook and their friends. Heather helped me out by bringing fun themed decorations like Scottish flag and thistle cookies, and a thistle shortbread that was TO.DIE.FOR. And, to the very brave Ginger who actually found my invitation post via Google and drove over to my house all trusty worthy-like, let me say that it was great meeting you! I was so glad to share this fun evening with y’all! 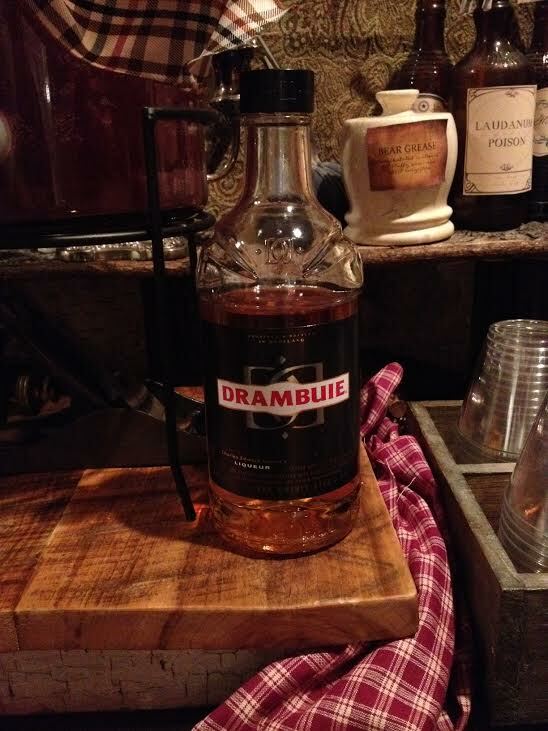 To celebrate the event, my friend Sue and I took a shot of Heather’s Drambuie, which was surprisingly not gross. I’m not a whisky girl, but this stuff was pretty good! If you missed the first episode and are dying to know what this is all about, you can find it on Starz (or Netflix if you’re outside the US)! Keep in mind it’s rated TV-MA so don’t try to sneak it at work or anything. LOL! The show will air every Saturday night on Starz. AND they just got renewed for Season Two, so that means it is already a huge hit right outta the gate. I have no doubt this show will be a raving success for Starz, which means you won’t get sucked into a few episodes, only to have it end abruptly mid-way through without tieing up loose ends. I will be watching. Will you? Awesome, awesome, AWESOME! I’m so sorry I missed it, but I’m verra impressed! 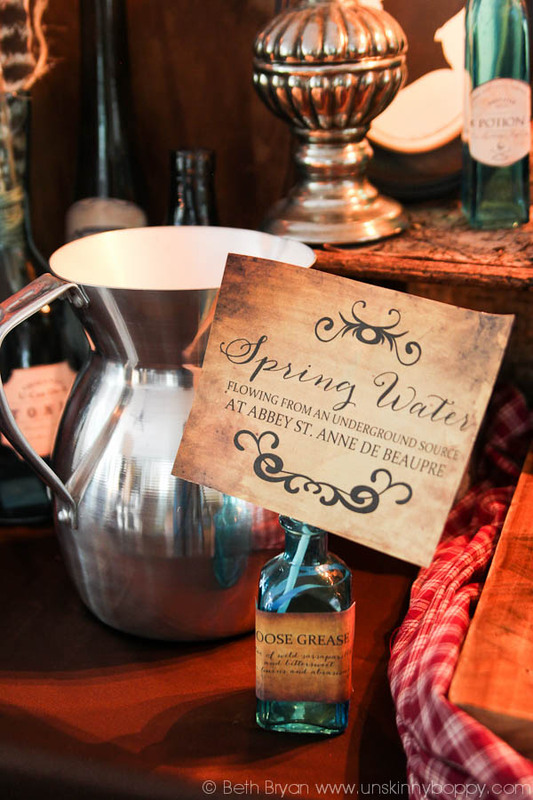 Your own parchment labels are the best. 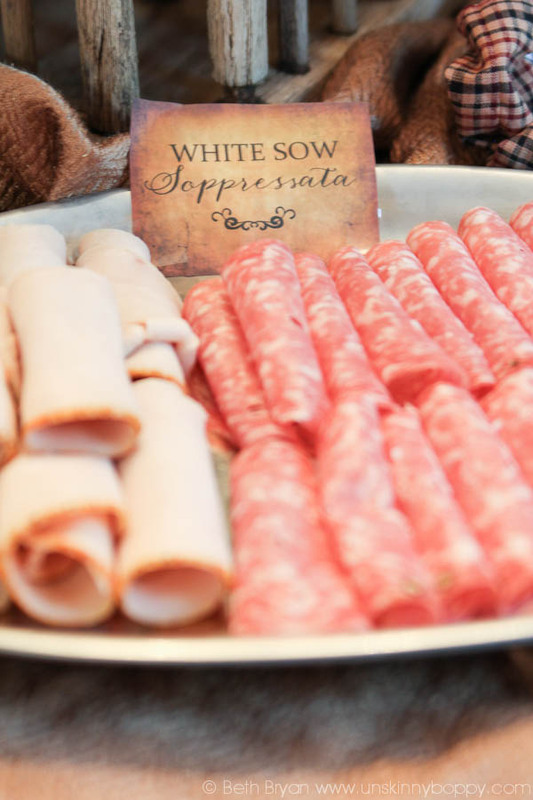 My favorites were the Piglets in a Blanket and the White Sow Soppressata…probably because I’m in Snow & Ashes right now, and she’s always bedeviling them. Well done! Thanks so much for sharing! Wow, just wow! What attention to detail. I don’t know how you thought of all of that but it’s just perfect! I’m so excited about the series and we had to order more channels even in order to see it! Wonderful! I soooo wish I lived close enough to attend. I have a serious addiction to the series, & have read through all the books several times (in order, of course). Currently do not have cable, so watched via the computer. We will be moving to FL soon & I hope to persuade my in-laws to add Starz to their satellite. 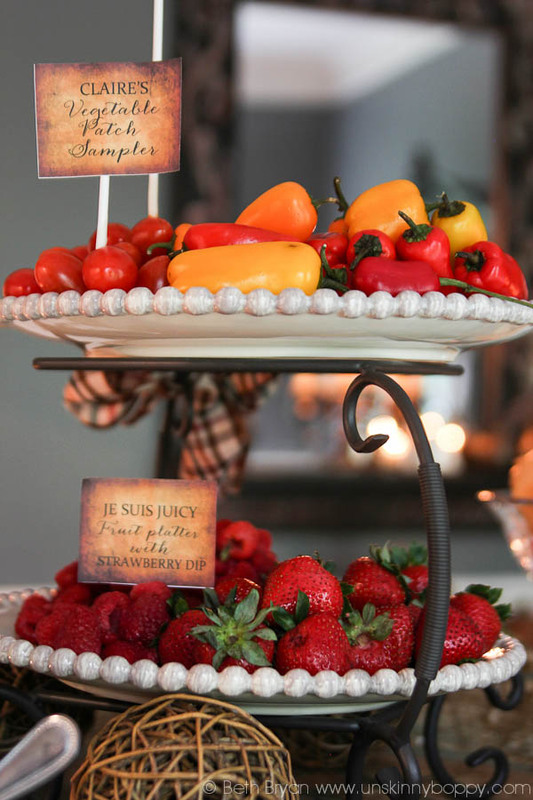 Love your blog and your over the top entertaining style. Thanks for sharing! 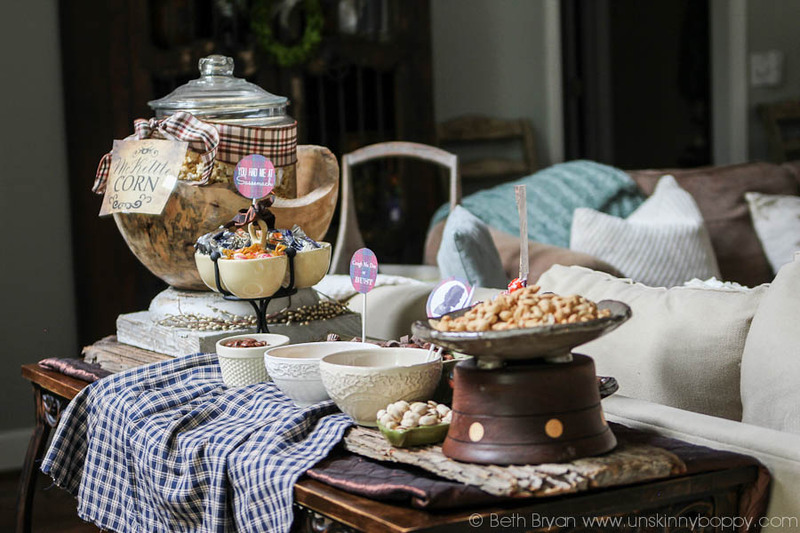 wow, girl, you sure know how to throw a party! I am seriously impressed! Next time you throw one, I will glady help clean up with the hopes of enjoying some leftovers. Wow, again. You are THE hostess with the mostess hands down. How fantastic! Looks like a great party. Oh. My. Goodness! 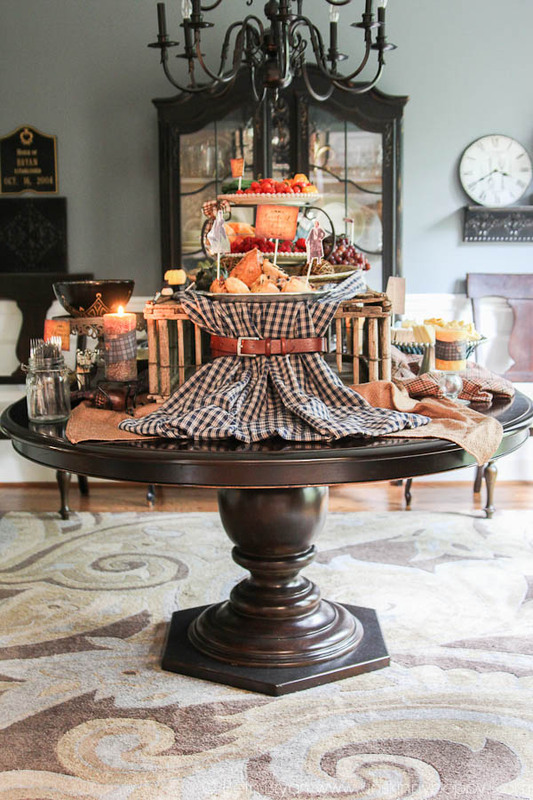 That is one fabulously decorated party table! 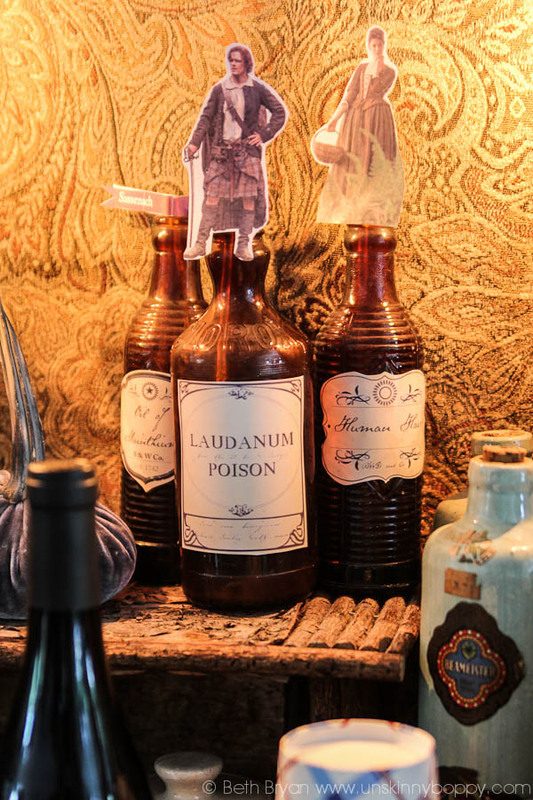 I know you said that some of the labels were from another source but did you do the ones that looked like they were handwritten on the old paper? Love those! LOVE me some Outlander!! Looks like a fab party!! Greatness!! Wow! 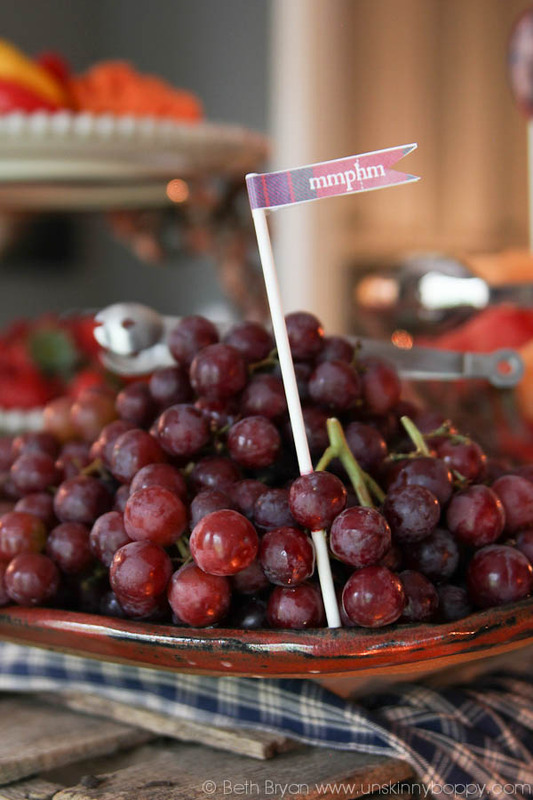 What an awesome theme party…no detail missed! Holidays must rock at your house Beth! You are an amazing fan!! What a great tribute to the story and the series! You rock girlfriend! You are going to be flooded with real life friend requests! Wish I lived closer. Absolutely loved your artistry and imagination. Keep it up. 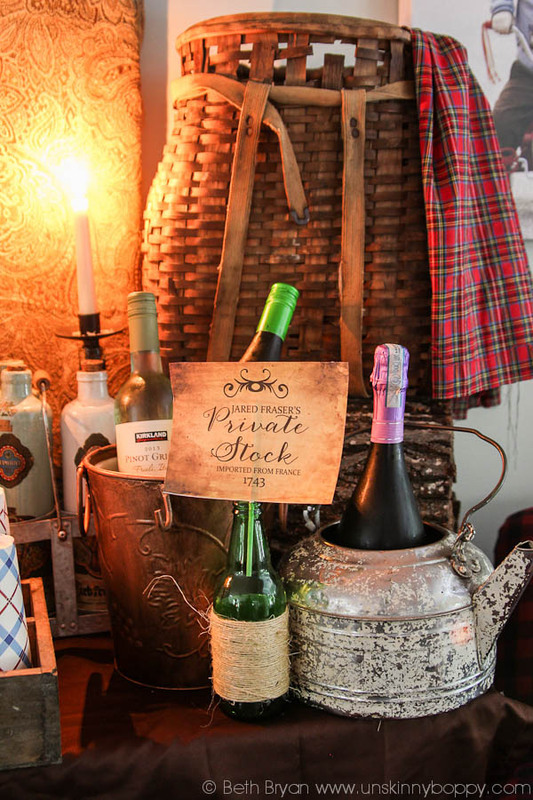 We look forward to different themed Outlander parties. ie Bree’s birthday, Roger & Bree’s wedding, Fraser’s Ridge housewarming, etc. Wow – you really went all out for the party. I don’t have even a thimble-full of that creativity, but lucky gals that got to share that with you. Can’t wait for season two to come. Thanks so very much! I’m waiting impatiently for April, too! WOW!! YOU did an amazing job!! I have read all the books and watched Season 1..am recording reruns on Starchoice here in Canada on Fridays nites.! LOVE Outlander!! Unfortunately this “professionalfangirls.com” link is no longer valid. Love this printables, but does anyone know where I can find these, does anyone have the pdf or know where to download these files please? 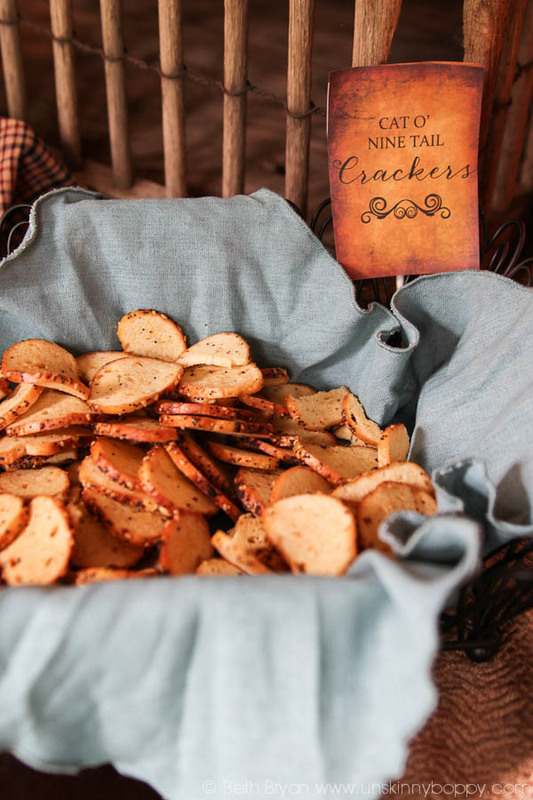 Would love them for my Outlander Season 2 viewing party this weekend. Thanks. Thank you so much for these! Your party looks wonderful! This is EPIC! I took your class at Haven and had no idea you were a fellow Outlander fan -yea! The “Droughtlander” is over!! This is amazing, Beth! One of our group members alerted me to the WW article, and one thing led to another, and here I am. 🙂 What an absolutely awesome spread, and your printables are great! 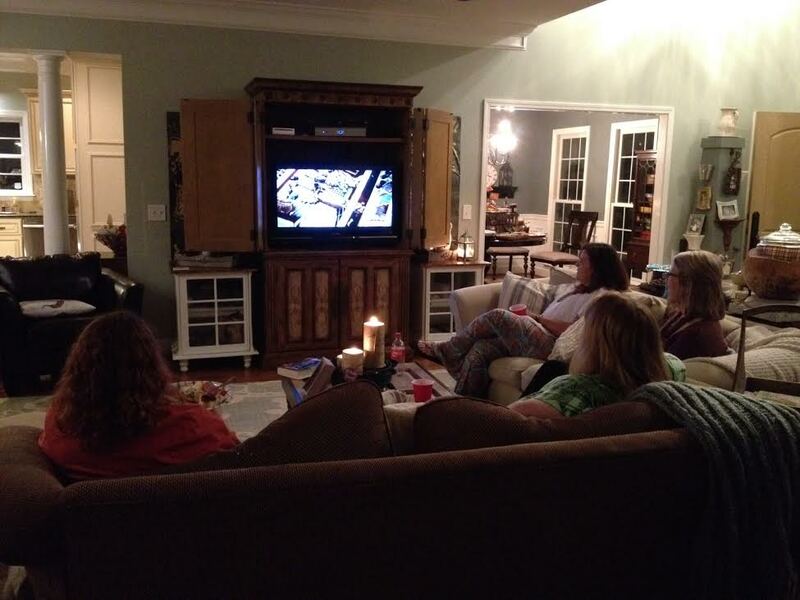 Thanks for sharing–we may have to throw another viewing party!